Is it true that on Sundays during Lent, you can go back to doing whatever you decided to give up? Short Answer: It depends on what you are giving up and why you are giving it up. Long Answer: In order to embrace the penitential character of Lent, some people will give up certain worldly pleasures or things that they typically enjoy, such as chocolate, video games, or watching TV. Or, they will take this opportunity to finally overcome habitual sins or bad habits. That thing you always find yourself confessing? Lent is a good time to rid yourself of that. But what about Sundays? Isn’t Sunday a time of joy, celebration, and relaxation? It seems that the whole spirit of the Sabbath day is opposed to self-denial, which causes many people to choose this day to indulge in whatever pleasure they are giving up during Lent. This is acceptable, but we have to be careful. Sometimes this indulgence can lead to a misunderstanding of what Lent and the Sabbath day are all about, if we approach these things with the wrong mindset. It is true that Sunday is more a time of prayer, almsgiving, charitable works, spiritual retreats -- basically, doing positive things – then it is a day of fasting and abstinence, which are more negative actions of avoiding things. But, it is also true that we should always be working towards greater self-mastery and the conquering of sin in our lives. So, while technically it would be okay for you to eat that candy bar on Sunday, if you have trouble saying no to your cravings, I don't think it would necessarily be against the spirit of the Sabbath day to exercise some restraint. It is really for you to decide whether or not that is something you need to do. Of course, if what you are trying to give up is a sin, then you should never give in to that! The problem is, when you view Sunday as a break from your self-imposed penance or abstinence, then a day of quiet thanksgiving can quickly become a day of gluttony and self-indulgence. The key is to relax your sacrifices while still making Sunday the holy day that it is meant to be. This requires balance and moderation. So, if you are giving up chocolate, I suggest eating two or three, not the whole bag. If you are giving up Facebook, spend an hour online, not the whole day. That way you are acknowledging the celebratory spirit of Sunday without getting too carried away. Remember, Sunday is a day of doing good works, of being charitable and growing in your own spiritual life … not a day of feasting on your guilty pleasures. Do you have any words of wisdom on "spiritual dryness"? The books I have read on the subject seem to be for the more spiritually advanced and are too difficult to read for my simple mind. Any suggestions? To be honest, I often struggle with the same thing, which is why I have put off answering this question. But, in light of the season of Lent when people are trying their best to pray more, it demands a response. I've been thinking a lot about this, and the word that keeps coming to mind is "perseverance." Paul tells us, "It is for discipline that you have to endure. God is treating you as sons; for what son is there whom his father does not discipline?" (Heb 12:7). Spiritual dryness is meant to discipline us and to mold our faith. Our faith becomes stronger when it perseveres through times in which God seems utterly absent from our lives. It is a strong and disciplined faith that is able to say, "I feel as though you have left me, you no longer hear my prayers. But, I pray nonetheless, because in faith I believe that you never leave us." St. James tells us, "Blessed is the man who endures trial, for when he has stood the test he will receive the crown of life which God has promised to those who love him" (Jas 1:12). Grace and fellowship with God is our reward, if we will only persevere. "Patience" is another key word. "But if we hope for what we do not see, we wait for it with patience" (Rom 8:25). Prayer takes time, persistence, and effort. It is certainly not something that we master over night. I get frustrated quite often by this, and many times I have succumbed to the temptation to just give up on prayer. "My prayer life is so lousy, how could it ever get better?" But, this is foolish, and not befitting of a man with discretion (cf. Prov 14:17). Rev 1:9 I John, your brother, who share with you in Jesus the tribulation and the kingdom and the patient endurance, was on the island called Patmos on account of the word of God and the testimony of Jesus. Rev 2:2,19 "'I know your works, your toil and your patient endurance, and how you cannot bear evil men but have tested those who call themselves apostles but are not, and found them to be false; 19 "'I know your works, your love and faith and service and patient endurance, and that your latter works exceed the first. "Patient endurance"...this is key to the Christian life, and John speaks of it in Revelation as if it were one of the characteristics of faithful Christians. "Here is a call for the endurance of the saints, those who keep the commandments of God and the faith of Jesus" (Rev 14:12). May you be so qualified. Fr. Robert Barron's "Catholicism" Series: Why Should I Care? Typically, I don't post things on my blog that are particular to my parish or my city because, well, there aren't that many people from Owensboro who actually read my blog. But, I think I will make an exception in this case. My parish will soon begin "Catholicism", Fr. Robert Barron's 10-part video series and study on the beauty of the Catholic faith (click the link for more information). I wrote the following for the parish bulletin to encourage people to attend. Even if you don't go to Blessed Mother Church or even live in the area, this post may still inspire you to attend a "Catholicism" study in your neck of the woods or to bring it to your own parish. 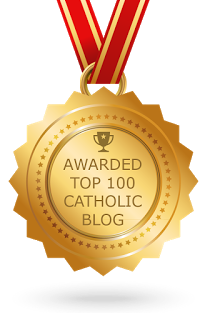 Why should I join the 10-part “Catholicism” study that is coming soon to this parish? First of all, it is saturated in the real and majestic beauty of our faith, and beauty is a very attractive thing. Some people are compelled by doctrinal arguments to embrace Catholicism. Others are convinced by their experience, by the emotions they feel when they go to Mass or interact with their Catholic friends and family. But, everyone is attracted to beauty. God placed it in our hearts to be attracted to it. After all, God is Himself beautiful, and so an attraction to beauty draws us closer to Him. It makes since that Catholicism, which provides the fullest experience of God, would itself be a beautiful religion. And it is. Sometimes we forget how beautiful our faith is. This study and video series by Fr. Robert Barron reminds us of that. Faith, especially for life-long Catholics, can grow mundane and stale. In times like this, we need to be reminded of what makes Catholicism so special, and attractive and appealing, much like how a husband needs to be occasionally reminded of how beautiful his wife is. If you need to be reminded of why you’re a Catholic, why you go to Mass every Sunday and go through the motions, then come to this study. If you have a friend or a family member who has been thus far unconvinced by your doctrinal arguments in defense of the faith, bring him to this study. Maybe the beauty of Catholicism is what will finally appeal to him. Another reason to come to this study is because it is profoundly catechetical. By that I mean, you will certainly learn a thing or two! Fr. Robert Barron, who is your tour guide through the vast Catholic world, is one of the greatest religion teachers of our time. I wholeheartedly believe that. He reminds me of Fulton Sheen in his ability to teach the faith and tell stories and interact with his audience in a way that is engaging and personable. What this means for you is that you will be entertained, but you will also come to understand your faith better. If you have never felt like one of those Catholics who can talk about his faith with others or answer their questions, this study is for you. Fr. Barron operates on your level … and on every level for that matter. The material he presents is very accessible, no matter where you are in your faith journey or understanding of Catholicism. Our first session is Mon., Feb. 20, at 10 AM in the Youth Room, or Tues., Feb. 21 at 7 PM in the Parish Hall, whichever one you prefer. The price is only $15! Please join us! Bring a friend! Before I begin my review, I hope you'll indulge me for a moment as I take a trip back to the recent past. It's the Spring semester of 2006. I'm on the campus of Franciscan University of Steubenville, excited to get my grad studies underway and anxious to see how I measure up to my peers who actually have a background in Theology. But that will have to wait. Why? Because, at this point in our flashback, I'm looking around at a bunch of pimple-faced undergrads. I'm sitting in Dr. John Bergsma's "Principles of Biblical Studies 1" (PBS 1) class because I have to get some prerequisites out of the way before the real learning can begin. Or so I thought. What I didn't know at the time was that this class would prove to be one of the most influential classes of my academic life. Before you can really be acquainted with Bergsma, the author, you have to get to know Bergsma, the professor. I want to take some time here now to explain to you what makes him such a great teacher. Those same things are what make his book such a worthwhile read. I have not had very many professors who are as effective and engaging and personable as Dr. Bergsma is. On the first day of class, he told us his conversion story and he got teary-eyed. That made a huge impact on me, considering that he's probably told that story dozens of times before. But, what impressed me the most was his uncanny ability to "break open the word" and make it accessible to us, while still remaining faithful to it's meaning and to the teaching of the Church. He did this in a number of ways. First, he used humor. Some people have this notion that you're not a real academic unless you're dull, and stuffy, and lifeless. Bergsma isn't like that. He's not afraid to have a little fun with the subject matter, not in a disrespectful way, of course, but in a way that helps you to really see and understand what is happening. Take Gideon, for example. When God called him, Gideon was threshing grain. Big deal, right? But, once you consider that Gideon was the youngest of his brothers and a member of the lowliest tribe of Israel, and then you see Bergsma bent over, pacing back and forth in the front of the classroom like he's threshing grain and then pop his head out from behind the podium, look back and forth nervously, and then let out a weak, "Who? Me?" -- well, that helps you to understand how amazing it was that God called Gideon in the first place. Or, consider the love story of Ruth and Boaz. Bergsma was sure to tell us that if a movie were made about their story, Ruth would be played by Sandra Bullock and Boaz would be played by Arnold Schwarzenegger. Of course, you can't mention Arnold without doing an impression of his voice. And Bergsma did. It was hilarious, but it also showed us how extraordinary it was for someone like Boaz to take in and care for Ruth. These are just two examples, many more could be given. My point is that Bergsma is able to use humor in a way that makes the Word more accessible. Laughter increases receptivity and openness. I think he knows this, and he utilizes it to great effect. Secondly, Bergsma is utterly unpretentious. Some professors are so knowledgeable in their field that they portray this aura of "I am entirely other-than and greater than you." You are afraid to even approach them, lest your presence or meager words inconvenience them or deter them from "more important things." But Bergsma is just the opposite. It downright scandalized me how open and accessible he was! He would add his students as friends on Facebook and write on their walls. Message him any question about the bible and he'll answer it. He remembers your name too. He'll say hi to you in the hallway, even call you over to chit-chat for a bit. When my wife Amy had a little graduation party in Steubenville after she graduated from FUS, Bergsma actually came to the party! In one sense, we couldn't believe it, but in another sense, we could. This was Bergsma, after all. He let my wife and I and some friends take him out for a beer once finals were over and the last paper had been graded. My wife and I even babysat for him on a couple of occasions! I never knew that professors could be that way, so humble and inviting. But, they can be, and Bergsma is. Thirdly, he's not afraid to be a Scripture scholar firmly rooted in the Tradition of the Church. Some people think you're not a real academic unless you're questioning the authorship of a certain book, or denying that Christ instituted this or that sacrament, or proposing some other off-the-wall theory that does nothing but scandalize people in the pews. Bergsma scoffs at all that. More importantly, he realizes that the role of the theologian and the Scripture scholar is to communicate the profound truths of Divine Revelation in a manner that allows every man -- degree or no degree -- the opportunity to know and understand what God wants to say to him. This is probably the quality of his that allowed me to get the most out of the Bible. When Bergsma reads the Old Testament, he sees Jesus everywhere, a lot like the early Church Fathers did. But none of it is a stretch. Jesus really is there, I just never noticed Him before. He's in the mediator of every covenant, He's in the Passover meal, He's in the temple, He's in the priesthood, He's in the prophets, He's in the psalms, He's in the very people of Israel. It takes the eyes of faith to see this, and it takes a professor firmly committed to the religious sense of Scripture to teach it. To be sure, Dr. Bergsma is no slouch. He got his PhD at Notre Dame. He's written academic papers for peer review journals. He goes to the bible conferences. He gives talks all over the country. He just refuses to let all of that deter him from what is important. This is PBS 1 after all. A bunch of freshman and sophomores (and grad students with some catching up to do) don't need to get caught up in the minutia of which passages in the Pentateuch come from the "Yahwist" source and which ones come from the "Elohist" one. They just need to know what the Bible is and how it can be so extraordinarily meaningful for every person. Finally, Bergsma is a holy man. He probably wouldn't appreciate me saying this, but he is. I can tell. I told you his conversion story got him all teary-eyed, right? Well, sometimes the Word does too. He'll be explaining a passage and then all the sudden find himself overwhelmed with emotion. That doesn't happen unless you have a close relationship with the Lord and you have allowed Him to penetrate the depths of your heart with His Word. My most endearing image of Dr. Bergsma is not him in front of the classroom, pretending he's Samson with pillars falling down on him (as endearing as that is! 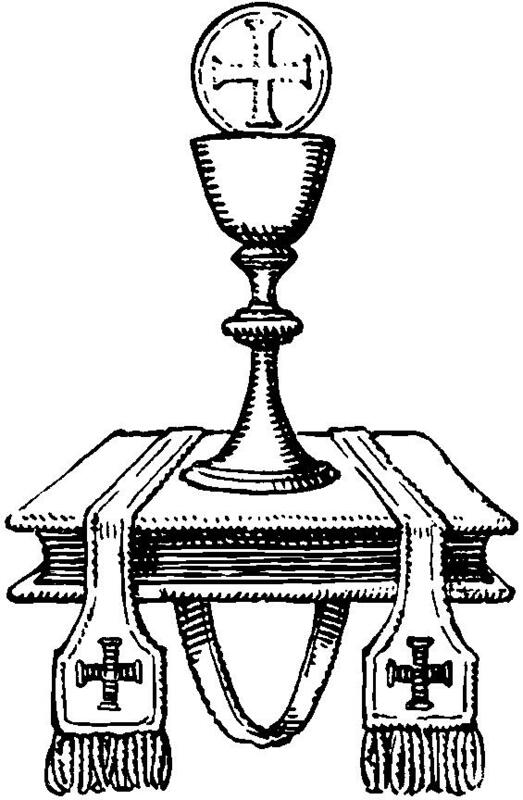 ), but him kneeling in front of the monstrance during Eucharistic Adoration at the local church, with one of his daughters dutifully kneeling beside him. I think I'll always remember that because it showed me that Bergsma doesn't just approach God or the bible as one of many subjects to be taught in the classroom. His teaching and study of the Word flows from an honest-to-God relationship with the Lord, and a strong desire to know and love Him better. I strongly believe that about Dr. Bergsma, regardless of him being too humble to admit it. That's Bergsma, the professor. Now I can finally talk about his book! 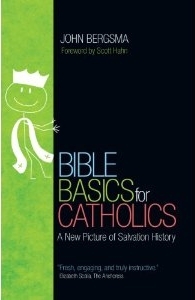 His new book, "Bible Basics for Catholics" is basically everything that makes PBS 1 (on the Old Testament) and PBS 2 (on the New Testament) such great classes at FUS. I think it is without question that his PBS classes were the most popular classes on campus. Even students who weren't theology majors would register for PBS, just so they could see what all the fuss was about. This book is PBS on paper, the fulfilled wish of every student who has ever taken PBS. The humor is there. The accessibility is there. The analogy of faith is there. The devotion is there. And, to my delight, the stick figures are there too! Bergsma, besides everything else that makes him such a popular professor, is also known for the stick figure drawings he puts up on the board in order to illustrate what is happening in the Bible, or to show us the "big picture" of what God was trying to do. As a student I recall copying them in my notes to the best of my ability, but never feeling that I had done them justice. Thankfully, this book contains not only the drawings he uses to illustrate the six covenants of the Bible, but also step-by-step instructions for how to draw each one! With that, his book becomes a tool not only for the student of Scripture but also for the catechist who wants to teach these "Bible basics" in a fun and memorable way. I mentioned the six covenants. That's basically how the book is structured: it's a march through the Bible with the covenants as our guideposts. With the aid of his stick men, and his usual wit and intelligence, Bergsma guides us on a tour of the Adamic, Noahic, Abrahamic, Mosaic, Davidic, and New (or "Eucharistic") covenants. He also fills in the in-between, giving us the people, and events, and historical accounts that brought man from one covenant with God to the next. In so doing, Bergsma has given us a splendid "bird's eye view" of the Bible, the "big picture" of God's plan to unite all of mankind unto Himself. I can't emphasize enough how important this big picture of the Bible is when studying the Word of God. This covenantal framework insures that no matter where you are in the Bible you can orient yourself according to the covenant in force at the time. Also, with this big picture in view, we see that nothing that happens in Scripture is coincidental or meaningless. Instead, all of it is according to God's plan, which He had in mind from the very beginning and strove so tirelessly to fulfill. One positive effect of this framework for my own faith is that it made me appreciate the Church more. If you think about it, God prepared for thousands upon thousands of years, through relentless patience and forbearance and unquenchable mercy, to give us what we have today in the universal Church of Christ. How lucky I was to be simply born into it! How happy are the many who discover this Church in adulthood and enter in to it! The Church means a lot more to me now after having seen how much God went through just to give it to me. That's just one happy consequence of Bergsma's classes and this book. I'm sure there are many others, which you will have to discover for yourself by picking up this book as soon as it is available. 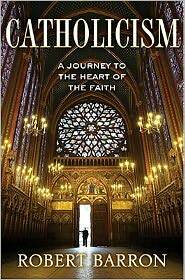 It will be released on May 14, but it's available now for pre-order at Amazon or your local Catholic bookstore. I give it my highest recommendation and wish Dr. Bergsma all the best. He deserves it.